Zuri brings to you 4 best smokey eye makeup tips for gorgeous looking eyes at parties and weddings. There’s a famous saying ‘the eyes shout what the lips fear to say’. Besides, the best way to attract attention is with your lovely eyes. 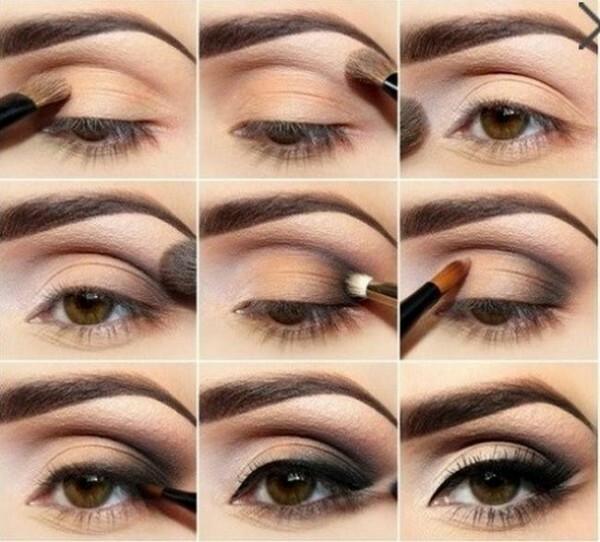 So, just follow these simple steps for a gorgeous smokey eye makeup. Now, create a sophisticated dramatic impact at parties and social get-togethers. 1. The classic smokey eye is done best with the shades black, gray, bronze and brown. You would need atleast three shades of the similar hue to create this look. Pick up three shades of a color, a light creamy color, a medium base color and a dark smokey color. Begin your smokey eye look by highlighting your brow bone from the beginning to the end of the brow. Use the lightest of the three colors as the highlighter. Also, sweep some of it on the inside corners of the eyes. Next up, take your middle eye shadow shade and sweep it over your entire lid. Apply it upward only up till the natural crease and not all the way till your brow bone that you’ve highlighted. Now beginning at the outside corner of your eyes, make ‘<‘ shape strokes with the darkest shade on the lash line, back up and around on the crease of the eyelid. But make sure that you don’t apply the dark shade too far in. The inner half of your lid should not have any dark color on it and the outside corner of your lash line should be the darkest. Now, blend the different shades of eye shadow with soft, gentle strokes of a clean blending brush to give it a smooth ombre effect. 2. It’s now time for an eyeliner to come into play. 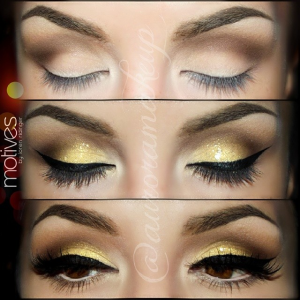 Wing tip and cat eye styles go very well with the smokey eye look. You could use liquid or pencil eyeliners to create this look. For a cat eye, use an angled brush to apply a thick line on your upper lash line, extending past the outer corner of your eye ending in an upward flick. Similarly, for a wing tip style, apply liner starting from the inner to the outer edges of your upper lash line. Now carefully draw a line at 45 degrees starting at the outer corner. Now draw a second line starting from the inner corner extending all the way to meet the first line that you drew. Now use a pointed brush to fill in color between these two lines to make a perfect wing tip. For a more dramatic look, draw a thick line close to your lash line and smudge it with a Q-tip or a brush to give it a blurred look. 3. Line your lower lash line with a kajal pencil. Now carefully curl your lashes and apply a coat of mascara to your upper and lower lashes to give them an illusion of length. 4. Lastly, do away with any eye shadow fallout by sweeping away the pigment with the flick of a clean brush and you’re ready with your sultry smokey eye makeup. Use good quality, clean brushes for this look. The best application brush to do smokey eyes is the dome-shaped eye shadow brush, rounded at the top. While creating this look, always make sure that your eyebrows are well shaped because with the smokey eye look we are aiming at bringing all the attention to your eyes and unkempt brows could play a spoil sport with this look. 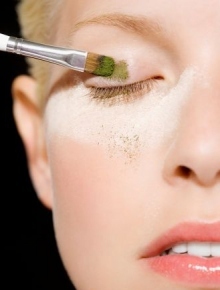 Always prep your lids with a primer before doing smokey eyes. It not only prevents creasing and helps your eye shadow stay in place but also helps the pigment to stand out and look more vibrant.